The settings dialog contains several tabs with specific settings under each one. This page describes the Strategy tab. The Z1 Dashboard helps you with many strategy aspects of your race. For example, when you are approaching your pit stop the track map dashboards will start to display a highlighted snake on the map. This snake shows you approximately where you will rejoin the track after your stop. This can be used to help you determine when to make your stop. In addition the cars near you will be highlighted at this point and remain highlighted until after you and they have pitted. This is because during pit stops you are sometimes racing cars that are not near you on the track. Having the cars that you are racing highlighted allows you to see them easily regardless of where they are on the track. This allows you to specify when the snake are car highlighting should start. If you set this to 3, then when you get down to 3 laps of fuel remaining the track maps will start to display the snake and highlighted cars. Note that you can also assign a button to toggle this highlighting as well, so that you can have it on whenever you like. This is the time it takes for you to pit. The Auto settings will let the Z1 calculate the time of the pit stop. This is done using several criteria including the average of previous stops, pit speed limits and pit lane length. If you set this to a specific time, then the Z1 will always use that time for all pit stops. When set to Yes the highlighted snake will be displayed on the track map to represent your approximate location after your pit stop. When set to No the old style 'After Stop' square will be displayed instead. Note that if there is not enough pit stop data to generate a highlighted snake, then even if set to Yes the old style 'After Stop' square will be displayed. This is the width of the pit stop snake highlight on the track maps. It is recommended to make the snake slightly wider than the track map width. Setting this to Yes will display the text 'After Stop' near the highlighted pit stop snake. Setting this to No will turn off that text display, leaving just the highlighted snake. This is the color used to render the After Stop Text, and the snake overlay. Click the swatch to display a color chooser so you can customize the color. This is the font size used to render the After Stop text. This is the number of stops you plan to make in the race. You need to manually set this for each race to make sure it is correct. This is very important in timed races. The Z1 does not know how many stops you plan to make if you do not tell it. Every pit stop you make reduces the amount of time you are on track. This reduction in time means that during a timed race you will do fewer laps, resulting in needing less fuel. If you plan to make one stop but this option is set to zero stops then the Z1 may over-estimate the amount of fuel you need to finish the race. It is therefore highly advised to make sure this is set correctly for timed races. If you set this to Yes then the Z1 will use the number of stops you plan to make when calculating the number of laps you have left to run in a timed race. This in turn will effect the amount of fuel you need to finish the race. It is recommended that you use this option in conjunction with the simulated race option to determine what works best for you. This is the color used to highlight the cars that are near you when they are being tracked during the pit stop window. When set to Yes cars near you will be tracked during pit stop windows. When set to No they will not be tracked. This is the maximum number of seconds a competitor can be either ahead or behind you in order for them to be tracked. This determines how the Z1 will determine the current pit lane speed limit. By default it will always try to get that information from the sim. If you select 'Always on entered limit' then the Z1 will use the speed limit you enter regardless of what the sim reports. This is the pit lane speed limit in either KPH or MPH that the Z1 will use if the sim does not report a pit lane speed limit or if you specify the Z1 should ignore any reported limit from the sim in favor of this number. This determine if the Z1 will run a simulated race once you get in the car. 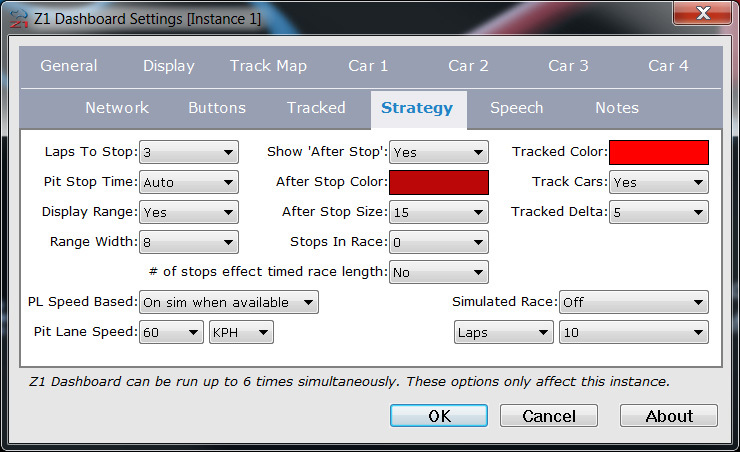 You can choose to have a simulated race start when you get in the car or when you press a button. Once started the simulated race will continue for the designated number of laps or minutes. All features of the Z1 will act as if you are in a race during this time. This is an excellent way to practice your race, check for the best strategy, and confirm the amount of fuel needed at a stop.